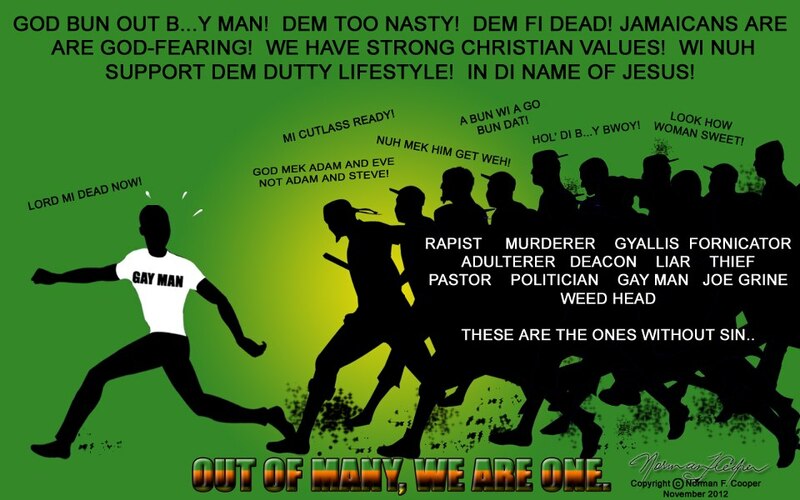 “…a mob of educated fools”: How will Jamaica staunch its homophobia? for more blood, more fire. to prove he is not like his son. In her, he will bury the fear. to his bruised and beautiful lips. Shirley’s poem quoted in full above with her permission is a timely intervention into the barbarism threatening to drown us. She speaks eloquently for those of us who yearn for a healing of the nation not unlike the one administered by the mother in this poem. The fish in this cartoon references current Jamaican slang for male homosexuals; in addition to ‘batty bwoy’ ‘fish’ is a popular synonym for gay men here. So the security guards at UTECH were exhorted to ‘Beat di fish!’ by the mob. 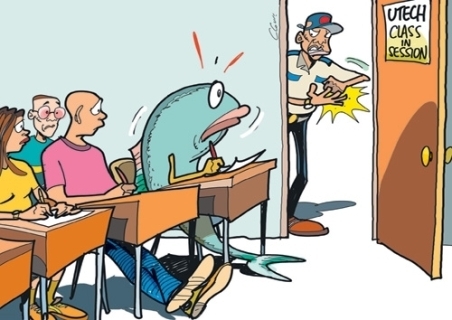 Obviously the common expression ‘like a fish out of water’ would also apply to this cartoon by Clovis, November 05, 2012, Jamaica Observer. It’s how to get more Jamaicans to adopt this reasonable outlook that is the problem. The visual below captures the absurdity of the Jamaican lynch mob well. Dry-eyed, I am weeping inside. It is not enough to condemn homophobia – the Ministry of Education, together with pro-active secondary school principals and the Principals of UWI and UTech, will have to design and implement programmes – as is done in the best US educational institutions – actively to educate young people to be tolerant, to thoroughly understand what it is that make us human, and to commit to defend the humanity and rights of others. When work of that kind begins, then we can say that something is being done. Otherwise, the weeping and wailing and gnashing of teeth after the fact, given that practically every public statement by an authority figure whether religious or secular demonizes and belittes gay people, is the worst kind of blatant hypocrisy. Previous Previous post: Gay Bashing in Jamaica a national policy?